Here’s our guide for the assorted options you can use to travel from Trieste to Croatia. 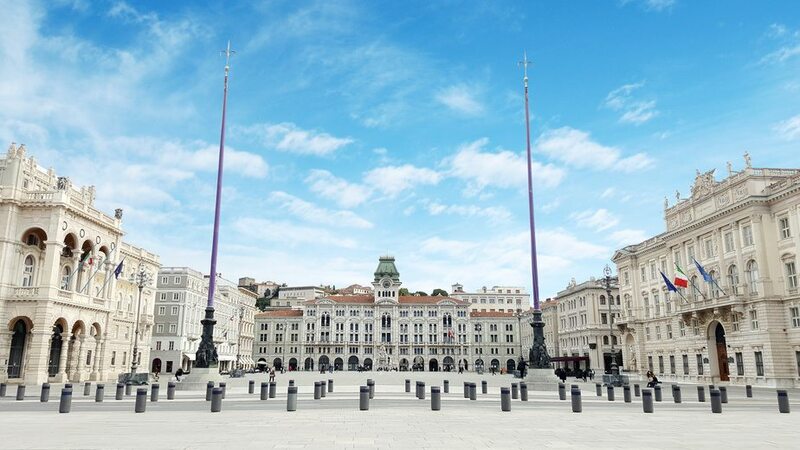 You should consider flying to Trieste if you’re intending on travelling to some of the more northern (coastal) regions of Croatia, such as Istria or the Kvarner region. It’s also not a bad place to fly to if you’re trying to reach Croatia’s capital, Zagreb, as there’s daily early evening bus services that take just over four hours. NOTE: Trieste is called Trst in Croatian. There are several buses a day on this route, with a journey time of only 2-2.5 hours. The services are run by Croatian bus company Autotrans – you can find timetables on their site or on the Trieste Bus Station website. Buses depart from the main bus station in Trieste, situated at Piazza della Liberta 11 (next to the main railway station). For a timetable of buses from Trieste Airport to the main bus station, see the the website of the bus operator APT Gorizia. This page on their site lists details of timetables; under the heading “orario collegamenti Aeroporto FVG”, you will find a PDF showing times for buses from ‘AEROPORTO FVG’ to ‘TRIESTE P.zza Libertà (Autostazione)’. Buses run pretty frequently, but do watch out for buses that only operate on particular days e.g. Mondays to Fridays, or Saturdays only. Buses from the airport to Trieste take about 50 minutes. See timetables on the Trieste Bus Station website. Some of these buses stop at other Istrian towns along the way, such as Buje, Buzet, Porec and Rovinj. Not ALL do, so please double-check timetables! You can also find bus times on the websites of the Croatian bus companies FILS, Brioni and Crnja Tours which operate the buses. They also provide online booking of tickets. Se above (under “Travelling from Trieste to Rijeka by bus”) for details of how to get from Trieste Airport to Trieste Bus Station. Trieste Lines run a summer catamaran service – they operate routes to Rovinj and Pula (and Piran in Slovenia) from the end of June to early September. There are now several daily buses from Trieste to Zagreb. Journey time is between 4-5 hours, depending on which bus you take. Croatia Bus and Autotrans both operate this route, as do Crnja Tours; the latter company’s route travels via Ljubljana in Slovenia. Another option is a bus that departs Trieste at 6.20pm, arriving in Zagreb at 10.50pm. This bus in fact starts in Florence, travelling via Bologna, Padua, Trieste and Ljubljana (Slovenia) before reaching Zagreb. It then travels on to Belgrade (Serbia) and Sofia (Bulgaria). What a long route! This service is run by Florentia Bus. There are daily bus services from Trieste to both Split and Dubrovnik, run by Croatian bus company Autotrans – you can find timetables on their site or on the Trieste Bus Station website. However, the journey takes 10.5 hours to Split, and 15 hours to Dubrovnik, so the journey isn’t exactly quick! If you’re trying to reach one of these two cities from Trieste, we would recommend travelling down the Italian side of the Adriatic to Ancona (for Split) or Bari (for Dubrovnik) instead, and then getting a ferry across.